Kopech did not debut this season until June 17 with one rehab start in Lowell before moving up to Salem on July 7 after missing about three months with a broken right hand. However, he made up for lost time with a dominant showing, posting a 2.25 ERA thus far with 82 strikeouts and 29 walks in 53 innings with Salem. Kopech notably flashed a triple-digit fastball this season and consistently throws in the high-90s. He will look to continue to refining his command and secondary offerings in Arizona. Perhaps no Red Sox prospect has had as consistently a strong season as Dubon in 2016. The diminutive infielder hit .306/.387/.379 in 62 games with Salem. 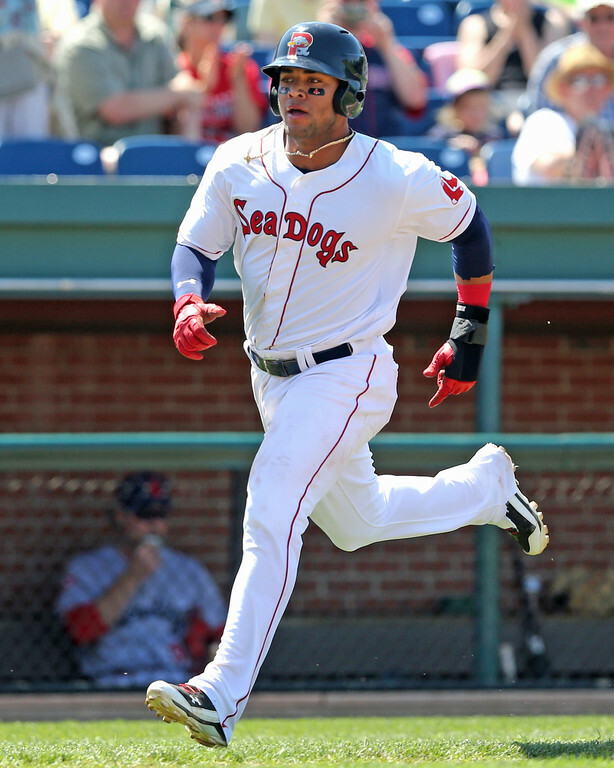 However, it was after a midseason promotion to Portland that Dubon really took off, slashing .335/.369/.542 with five home runs, after hitting none in Salem where power is suppressed. Ball improved in his second season in Salem, pitching to a 3.77 ERA (down from 4.73 last season) but his 6.7 K/9 and 5.3 BB/9 suggest that there's still work to be done. The 2013 seventh-overall pick has shown flashes of promising raw stuff and athleticism, but had little sustained success over his minor league career. Beeks continues to move quickly through the Red Sox organization after being drafted in the 12th round in 2014. The southpaw pitched to an impressive 3.07 ERA with 55 strikeouts and 24 walks in 67 1/3 innings in Salem then slipped to a 4.33 ERA in 62 1/3 innings with Portland. Beeks may not be a starting pitcher in the long-run, but with three average-to-better pitches and solid control, he could have a future in the bullpen. The Red Sox drafted Callahan in the second round in 2012, but he has yet to deliver on that potential. He has pitched better since being moved to the bullpen last season, featuring a 3.45 ERA with 60 strikeouts and 36 walks in 62 2/3 innings this year. This will marks Callahan's second invitation to the AFL, appearing in just three games last year while allowing one run over three innings. Mars enjoyed a successful season in Salem in 2016, slashing .293/.353/.401 with 31 stolen bases in 108 games. Left-hander Corey Littrell, whom the Red Sox selected in the fifth round in 2013 then traded as part of the John Lackey deal, is also going to the Arizona Fall League to represent the St. Louis Cardinals. Littrell pitched to a 3.97 ERA with 8.6 K/9 and 3.8 BB/9 in 65 2/3 innings between Double-A Springfield and Triple-A Memphis this season.